This is a set of conversation textbooks following the task-based teaching ideas. Being objective-oriented and task-based in communication, it combines the topics, functions and culture, so as to artistically integrate the form and meaning. It is suitable for total beginners of Chinese language and can be used by students of short-term or long-term training programs. 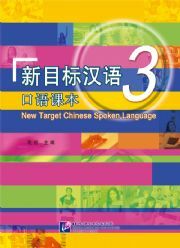 Volume 3 includes 10 units, which is suitable for pre-intermediate Chinese learners. It has topics such as the characteristics of a person, hometown, lifestyle, housing, an examination, shopping, experience on a day off, hobbies, occupations, the itinerary of a trip, etc. Each unit includes several objectives of the tasks and helps learners to achieve language acquisition when carrying out the tasks. It provides the English translation, full-color illustrations and pictures of the real objects. There is a recording CD in addition.